Many people like to kick-start their day with a really good cup of coffee. This is the book for them! 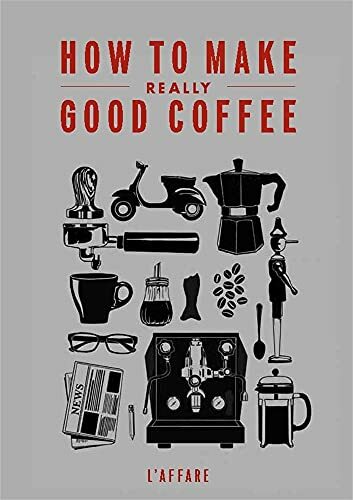 It gives a brief outline of how and where coffee is grown and processed and then "spills the beans" on how to get the best cup your chosen equipment can provide whether you use a plunger, filter, stovetop or full-blown espresso machine. Caffe L'affare first produced this book for the baristas who take a short training course with them, then the book was developed for the general market and the home user. Now it has been expanded to add further info on coffee tasting, production sustainability and the roasting process, along with hot tips, new step-by-step preparations, an all-encompassing glossary and a bright new look. Learn from the professionals and enhance your enjoyment of your coffee. Includes metric measures. Caffe L'affare was established in 1990, a pioneer of New Zealand's now thriving cafe and coffee culture. Still roasting from their central-Wellington premises, a stone's throw from their iconic cafe, L'affare is now New Zealand's largest premium coffee brand.